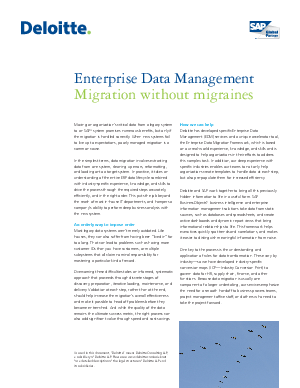 Moving an organization's critical data from a legacy system promises numerous benefits, but only if the migration is handled correctly. In practice, it takes an understanding of the entire ERP data lifecycle combined with industry-specific experience, knowledge, and skills to drive the process through the required steps accurately, efficiently, and in the right order. Read this white paper to learn more.